Unique dual-surface design has a soft microfiber cloth that quickly soaks up countertop splashes and spills on one side, and scrubbing loops that effectively clean pots, pans, dishes and glassware on the other. Double duty because of softer and rougher sides. So far I am happy ! 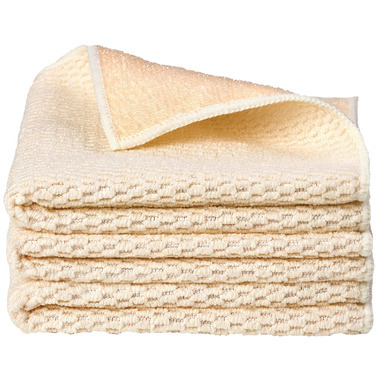 I really like the cloths, they are very soft and i like the rougher side for scrubbing. My only complaint is that i wish i got them in a darker color because they stain too easily. I'm not overly impressed. I find the cloths are too rough. Just OK. I find it holds the water in and when i wash off my counter top, it leaves it so wet.